Volunteers spend their Saturday cleaning Lone Fir Cemetery in preparation for Memorial Day. Cemeteries aren't where most folks like to spend their free time, but a group of volunteers chose to spend Saturday among the squawking crows and weathered headstones. 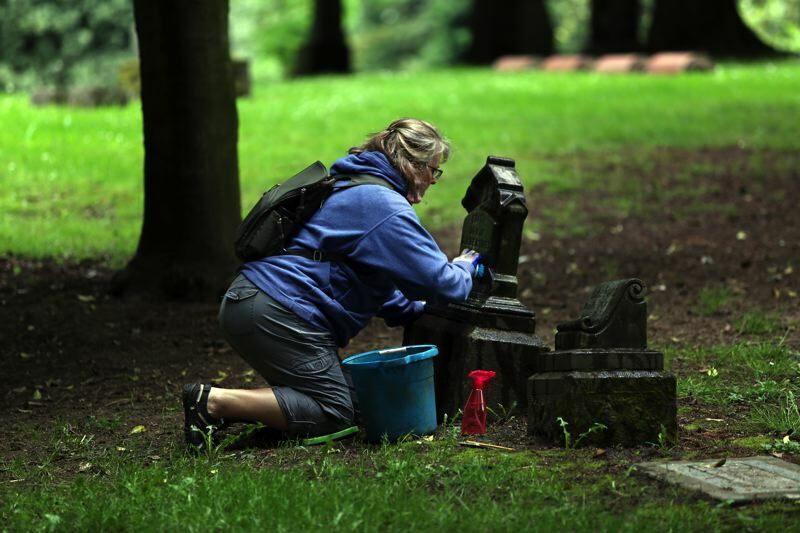 It was cleanup day at Lone Fir Historic Cemetery in Southeast Portland, where over two dozen volunteers worked to make the multi-use cemetery more enjoyable for all. The clean-up is usually held on Earth Day, but was moved closer to Memorial Day, when there will be a surge of visitors. SOLVE, an environmental nonprofit, turned it into a statewide event, along with the Oregon Commission on Historic Cemeteries. 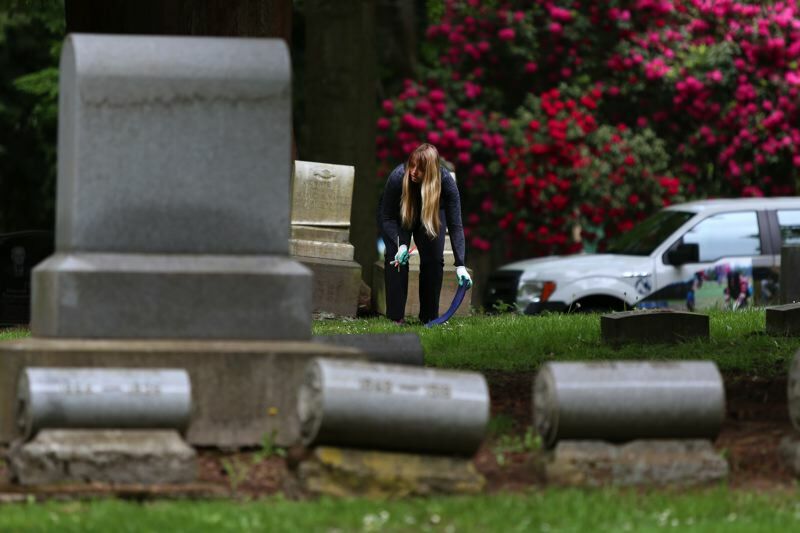 They declared May 12 as Oregon Historic Cemetery Cleanup Day, with similar events across the state. Volunteers young and old got on their hands and knees (with the help of some cut-up yoga mats) to use water, chopsticks and butter knives to clean and detail some of the headstones in the 30-acre cemetery. Lupine DeSnyder, volunteer coordinator for Metro Parks and Nature, instructed the group on how to properly clean headstones, some of which are over 150 years old. 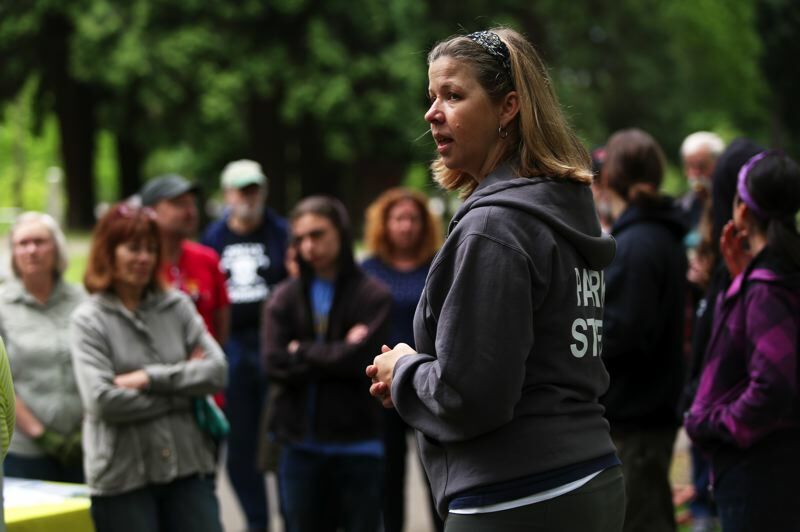 She told volunteers to focus on places they can see from the road, but also to feel free to wander, enjoy the nice day and explore the wooded cemetery. Volunteers scattered, carrying buckets and big bags for downed branches and twigs. Butter knives were handed out to tidy up the grass near the edges of the graves, and chopsticks for lightly cleaning the engravings on the headstones. The cemetery was founded in 1855, though Linda Werts — a member of Friends of Lone Fir — says the first burials were in 1846. According to her and Desnyder, the cemetery is used as a neighborhood park, where kids ride bikes, people jog and schools come on field trips. Although it's right in the city, it's a significant natural space in the area. The cemetery is home to a resident owl, a historic rose garden, the second-largest arboretum in Portland and the remains of about 25,000 people. Some folks, according to DeSnyder, were volunteering because they're avid history buffs and see value in preserving the historic cemetery, while others were looking for ways to help their community close to home. Becky and Bill Dresselhaus were detailing headstones for a more personal reason. "Our son is buried here in the Friendship Garden," Becky said. The couple's son, Sam, died in 2014 and loved visiting the quiet, tree-lined cemetery with his daughter. This is the Dresselhaus' third or fourth time volunteering at Lone Fir for cleanup. "It's very cathartic. You feel like you've done something," Becky said. DeSnyder said there's a lot of stigma around cemeteries, but getting more people involved means more of the community will come to understand what the cemetery is all about. She wants folks to know Lone Fir is more than just a cemetery; it's a resource and a place for the community to enjoy. "Everyone comes back," DeSnyder said. "Once you get a glimpse of it, you realize there's so much more to see." For more information, visit oregonmetro.gov.cemeteries. For Memorial Day on May 28, Portland Fire and Rescue will raise a flag at 10 a.m., and stories will be told about firefighters buried in the cemetery. Lone Fir will also host guided historical tours that last about two hours, and guided veterans' tours lasting about 45 minutes.